The Swedish Chamber of Commerce India in collaboration with Knowledge Partner, Chadha & Co. invites you to an interactive session on Labour Laws in India on March 29 in Pune. 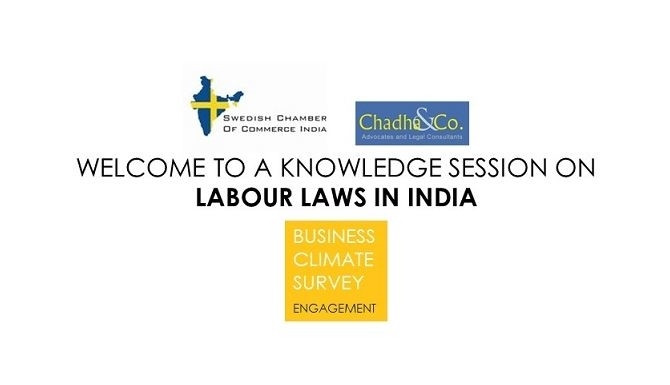 The Business Climate Survey 2015/16 conducted within the Swedish Business Community in India highlighted labour laws as an area of challenge for companies. During the second half of 2015 as part of the BCS engagement plan, SCCI together with the Embassy of Sweden in New Delhi, Consulate General in Mumbai and Business Sweden organized sessions with Swedish companies in Delhi, Bangalore and Pune to deliberate on these issues and discuss how to address them with relevant stakeholders, exchange experiences within the community and learn from experts within the areas. Venue: Atlas Copco, Sveanagar, Dapodi, Pune.